Over the past four months, I have been adding updates to my article, "The Phantom Menace: Fantasies, Falsehoods, and Fear-Mongering about Iran's Nuclear Program," whenever new predictions and allegations about Iran's nuclear program are released. May 4, 2011 - Sometimes Ehud Barak has trouble staying on message. Last year in Herzliya, he warned of Israel becoming an apartheid state like South Africa, a usually verboten analogy among Zionist officials, unless a viable Palestinian state is created soon. "As long as in this territory west of the Jordan river there is only one political entity called Israel it is going to be either non-Jewish, or non-democratic," Barak said. "If this bloc of millions of ­Palestinians cannot vote, that will be an apartheid state." Whoops. Just a few days ago, on May 1, both Israeli Prime Minister Netanyahu and Israeli President Shimon Peres repeated their dire warnings and tired talking points about the supposed Iranian threat. Speaking at the opening ceremony of Holocaust Memorial Day at Yad Vashem, Israel's memorial to Jewish victims of Nazi genocide, Netanyahu and Peres both "stressed Iranian nuclear aspirations as an existential threat to Israel," with Netanyahu declaring that "Iran, Hezbollah, and Hamas are working openly for the destruction of our people." He continued, "We cannot place our fate in the hands of others," and then warned that, "when Israel and the Israel Defense Forces say, 'Never Again,' they mean precisely that." Going for broke, Netanyahu just started making things up. "[T]oday, new enemies are rising, and as they deny the Holocaust, call for the destruction of our people," he said, "those wishing to destroy the Jewish state" are "arming themselves with nuclear weapons in order to realize those ambitions." Naturally, he threw in the "existential threat" canard: "The threat to our existence isn't a theoretical one, it cannot be minimized, it stands before us, before all of humanity, and it must be stopped," he bellowed. Peres went even further, stating, "Iran's fanatic leadership is a danger to the entire world. It is not only a threat to Israel. It is a threat to any household, anywhere. It is a real risk to the fate of humanity." Drawing a bogus parallel from Nazi intentions to Iranian ones has long been a mainstay of Israeli fear-mongering despite its obvious absurdity. The previous month, Barak told the Knesset Foreign Affairs and Defense Committee that "Iran does not pose an existential threat to Israel at this time." Barak then elaborated that "Iran has the potential to develop into an existential threat on Israel, and we are working to prevent that." A month before that, Barak, while speaking at the Washington Institute for Near East Policy (WINEP) in February 2010, said plainly, "I don’t think that the Iranians, even if they got the bomb, they are going to drop it immediately on some neighbor. They fully understand what might follow. They are radicals but not total meshuganas." He continued to explain his belief that the Iranian leaders "have quite sophisticated decision-making process and they understand realities." 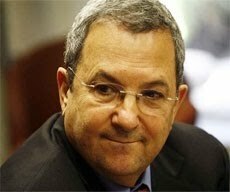 In September 2009, Barak, who was then the head of the Labor party, told Israeli daily Yedioth Ahronoth that "Iran does not constitute an existential threat against Israel." Later in the interview, he repeated this assessment, saying, "I am not among those who believe Iran is an existential issue for Israel," continuing, "Israel is strong, I don't see anyone who could pose an existential threat." Barak also stated, "Right now, Iran does not have a bomb. Even if it did, this would not make it a threat to Israel's existence. Israel can lay waste to Iran." In a direct rebuke of the oft-heard Netanyahu refrain, Barak said plainly, "I don’t think we are on the brink of a new Holocaust." Other Israeli officials, such as Tzipi Livni, have voiced similar - if not identical - sentiments. Beyond that, there is ample evidence that Iran, which maintains a strict "no first strike" policy, is not prone to act rashly with regard to military aggression, especially against countries with superior capabilities and nuclear arsenals. Efrahim Halevi, former Mossad head, revealed his calculation of the Iranian leadership to Trita Parsi in 2006, saying, "I don't think they are irrational, I think they are very rational. To label them as irrational is escaping from reality, and it gives you kind of an escape clause." In October 2008, Congressional foreign policy advisor Gregory Aftandilian, speaking at a Center for National Policy event titled "A Nuclear Middle East," noted that Iran is "not stupid" and "has a long history, thousands of years, of statecraft," concluding simply, "Tehran is not suicidal." Aharon Zeevi-Farkash, a retired Israeli intelligence chief acting as Iranian Supreme Leader Ali Khamenei, insisted Iran would regard its bomb as a means of "self-defense and strategic balance" -- an allusion to Israel's own, assumed atomic arsenal. In a reasonable and realistic critique of Jeffrey Goldberg's Israeli propaganda puff piece, Steve Clemons of the New America Foundation wrote last year, "Iran has shown itself to be a strategic, rational, albeit ruthless, calculator of its interests -- not an irrational, suicidal nation." Center for American Progress reporter Matt Duss and national security analyst Andrew Grotto also agree that Iran is neither a "suicide nation" nor a "martyr state." "But I'm telling you, I think they will pull back, add up all of the different factors. Iran has made rational decisions in terms of pros and cons and pluses and minuses in the long run." The following month, Mohammad-Javad Larijani, head of Iran's Human Rights Council and adviser to the Supreme Leader Khamenei, also assured Rose of his country's anti-nuclear weapons policy, saying, "We made our mind very, very clearly and very rigorously. We do not want armament, nuclear armament. This is definite. We made our mind, we want the most advanced nuclear technology for a lot of peaceful use." Despite the hysterical (and strikingly racist and Islamophobic) claims of opportunistic serial liars like Goldberg (who has warned of Iran's "theologically driven, eliminationist anti-Semitism"), Netanyahu (who accused Iran's leaders of belonging to a "messianic apocalyptic cult," presiding over a "fanatic regime that might put its zealotry above its self-interest," and described Iran as "a country that glorifies blood and death, including its own self-immolation") and Alan Dershowitz (who claimed Iran had "demonstrated a willingness to sacrifice millions of their own people to an apocalyptic mission of destruction"), even the United States government concurs with assessments that Iran is a rational actor on the world stage, concerned only with national self-defense rather than aggressive military offensives. In April 2010, in a statement before the United States Senate Committee on Armed Services, Defense Intelligence Agency director Lieutenant General Ronald L. Burgess stated, "Iran's military strategy is designed to defend against external threats, particularly from the United States and Israel. Its principles of military strategy include deterrence, asymmetrical retaliation, and attrition warfare." He added that Iran is "unlikely to initiate a conflict intentionally or launch a pre-emptive attack." The intelligence report delivered to Congress that day in conjunction with Burgess' testimony also revealed the assessment that Iran maintains a "defensive military doctrine, which is designed to slow an invasion and force a diplomatic solution to hostilities," and followed that "Iranian military training and public statements echo this defensive doctrine of delay and attrition." This identical position was reaffirmed this past March in Burgess' 2011 testimony before the Armed Services Committee. Excellent article, Nima. Really grateful for the work you do. Any thoughts on the rumored stand-off between Ahmadinejad and Khameini re: the Minister of Intelligence? Nima, great article as always. If you get the time investigate the communications between Iran and UN during the Iran-Iraq war. Also research the Swedish connection and why Olaf Palme supplied Iran with anti-aircraft missiles.. In early 80's Iran complained to UN about Iraqi use of chemical weapons. US played a decisive role in disallowing Iran’s call for a UN investigation as US was repeatedly and falsely asserting “both sides are using these weapons”. However, due to Iran’s consistent requests, after two years UN sent a delegation to Iran. The ensuing UN report confirmed Iraq was the only side using these dreadful weapons. Also find out why Iran, despite knowing how to build that kind of WMD never attempted to produce and use them. Apparently Swedes were convinced Iran is a victim. I know for sure they also treated in their hospitals many of the Iranian soldiers who were subjected to those horrifying weapons. If you spend some time researching the above I am sure you are bound to find truly convincing evidence on why Iran would never develop any type of WMD. Finally I see the above subject from the perspective of an Iranian ancient humanistic culture intertwined with a backward religious Hossein-Yazid phenomenon Yet I sense the issue is more complex than what appears on the surface. In my view you are the only one I know who is qualified to examine and properly analyze this important topic. Think about it, you have nothing to lose in unearthing and exposing a dark chapter of our recent history. It appears the Israeli government has really become politically bankrupt and has nothing else left to offer their people except FEAR.To make up for their incompetence, they hype and drum up the "Iranian nuclear threat" to rally their people (at least the majority right-wing nutters in that country) behind them and also to distract them from the main issue of occupation and the atrocities they commit daily in the occupied territories..It also makes a good soundbite to their Western backers who use the "Iranian nuclear threat" for electioneering slogans (also another FEAR factor) and such.. The whole thing's a scam and those in the West who see through it are forced into silence or blackmailed into submission.. Indeed, if Iran were after nukes, they would've got it by now. Even North Korea with very limited resources and under much heavier sanctions have managed to detonate a nuclear device without a fuss. Iran's leaders know the reality of PEAK OIL and any oil producing country that doesn't see this and seek alternative energy source is in for some real trouble. It's a matter of life and death for any nation.Iran without nuclear energy will eventually become indebted to their enemies who've made no secret about their intention to destroy her. "Drawing a bogus parallel from Nazi intentions to Iranian ones has long been a mainstay of Israeli fear-mongering despite its obvious absurdity." I'm afraid some Iranian opposition figures outside the country do much in reinforcing this imagery. Of course Nima doesn't have thoughts on that, he would NEVER post something that doesn't show Iran in the most positive of lights. A story about a crazy theocrat calling out ministers as witches and a figurehead president walking out on his job for 10 days is surely not something he would cover. Unless it occurred in a country he wasn't completely devoted to. Actually, I have been meaning to weigh in on the Ahmadinejad-Khamenei spat, but simply haven't gotten around to it yet. Hopefully I'll be able to write something about it soon. Incidentally, though it is perfectly clear that your comment alias "Dorothy Parvaz" is meant to smugly bring attention to what you perceive as the Al Jazeera journalist's plight in Iran (after having been detained in Syria for apparently attempting to enter the country on an expired Iranian passport and claiming "tourism" for her reason for travel, despite being there for work, and subsequently being deported to Tehran for questioning), it seems - now that Parvaz has been sent safely back to Doha - that your ire was misdirected. I was taken to the airport, but I was certainly not allowed to return to Qatar. Instead, I was dragged, kicking and screaming, onto a flight bound for Tehran (I'd entered Syria with an Iranian passport). Call it a strange brand of extraordinary rendition, if you will. The Syrian authorities had alleged to the Iranians that I was a spy – a charge that can carry a death penalty in Iran. Fortunately, in my case, the facts were borne out. After a couple of weeks of interrogations, the investigator in Iran charged with my case determined that I was not a spy, but a journalist. On Wednesday, without drama or incident, I was released and put on a dawn flight from Tehran to Doha – it was a simple matter of a judge's approval. Although I have written critically of some of Iran's policies, I was treated with respect, courtesy and care thoughout my detention there. So, "Dorothy," nice try this time. It often helps to withhold a rush to judgment until facts become available. There is plenty to criticize about the government of Iran - I myself am no fan (to put it lightly) of any sort of theocratic system, even one tempered somewhat by republicanism and democratic checks and balances - but your quick assumption of Iran's complicity and guilt in this affair has revealed your true agenda. As such, the only suitable response is this. I will post a link here to whatever I write about the Ahmadinejad-Khamenei fallout whenever I get around to it. The comments on this link seemed to disappear for a couple of days, so now that they're back : If you're going to use that handle, you'd better be Dorothy flipping Parvaz herself, otherwise that's just disgusting and tacky. The annoying "vanishing comments" problem was due to a Blogger issue that has, thankfully, since been resolved. I should have known it was Blogger being capricious. Thanks again and very much looking forward to reading more from you.